Chinese students are the largest international student group in UK universities today, yet little is known about their undergraduate writing and the challenges they face. Drawing on the British Academic Written English corpus - a large corpus of proficient undergraduate student writing collected in the UK in the early 2000s - this study explores Chinese students’ written assignments in English in a range of university disciplines, contrasting these with assignments from British students. The study is supplemented by questionnaire and interview datasets with discipline lecturers, writing tutors and students, and provides a comprehensive picture of the Chinese student writer today. 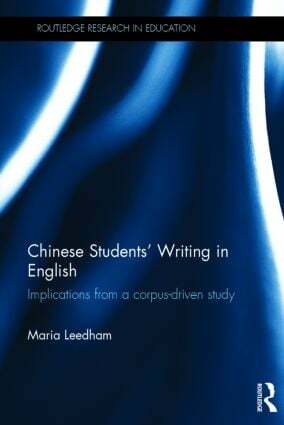 Theoretically framed through work within academic literacies and lexical priming, the author seeks to explore what we know about Chinese students’ writing and to extend these findings to undergraduate writing more generally. In a globalized educational environment, it is important for educators to understand differences in writing styles across the student body, and to move from the widespread deficit model of student writing towards a descriptive model which embraces different ways of achieving success. Chinese Students’ Writing in English will be of value to researchers, EAP tutors, and university lecturers teaching Chinese students in the UK, China, and other English or Chinese-speaking countries. Ursula Wingate, Senior Lecturer in Language in Education, King’s College London, UK. Hilde Hasselgård, Professor, University of Oslo, Norway. Jonathan Culbert, EAP tutor, Xi’an Jiaotong-Liverpool University, China. Maria Leedham is Lecturer in Applied Linguistics and English Language Studies at the Department of Applied Linguistics and English Language, Faculty of Education and Language Studies, Open University, UK.